Storing items in a self storage unit can help clear up space in your home or office, providing a safe place for your valued belongings that you don’t require constant access to. In order to get the most from your unit, it is important to organize it well so that you can quickly find what you need later. Identify which items will be packed in boxes. These can be easily stacked (with the heaviest box on the bottom) to create more room in your storage unit, but if you don’t organize everything well, it will take forever to find something in the future. Make sure you stack boxes so that you can clearly see the label. It may be easier for you to label two or three sides, so that you don’t spend too much time focusing on placing the labels outwards. Bring a binder that shows what is in each box, or write the contents directly on the box. For instance, labeling a box “K1” can show that it is the first box of kitchen supplies. When you check the binder under K1, it will show exactly what is in the box (such as plates, dishes, silverware). Place the items you will need to access often closest to the front. Place the boxes you know you won’t need anytime soon in the back. You can also pack up items in reverse order. For instance, packing up holiday decorations in reverse order will help you decorate more easily next year. Whenever possible, store similarly sized items, or items that belong in the same room, together. 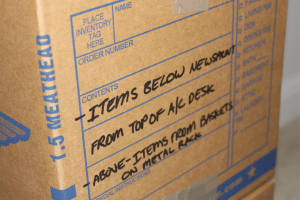 If you are packing up summer gear, holiday decorations, or items from the office, keep all like items stored together. This will make it easier to pack, find, and unpack later. You may also want to place small items inside of larger hollow items. For instance, consider storing small appliances in empty kitchen furniture or boxes of office supplies in an empty bookshelf. You will need to be able to move freely throughout your unit so that you can reach items in the back or corners. Work to create an aisle and some space along the back so that you can move around. Before you begin spending time organizing and moving your belongings, make sure you have chosen the right size storage unit. Organizing your unit well can help you save space and may allow you to save money on a smaller unit. However, nobody wants to pack up their items only to discover that the self storage unit they have chosen is too small. Remember, you can always change your unit later, if you find that you need more or less space than you currently have. Read our self storage tips for more information on moving and storing your items strategically. Contact Value Store It to inquire about our self storage units and free truck special.